Are you looking for WordPress Hotel Themes for your hotel business? If so, you are about to read the right thing. A good hotel is a hotel with nice location, high-quality service, luxury room, and equipment. To boost the hospitality service, you need an effective marketing channel. If you are finding a WordPress theme for that purpose, you are on the right topic. 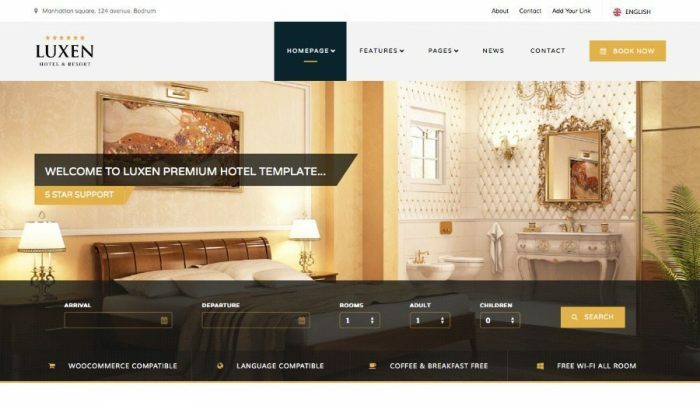 Today, I am going to discover another field of WordPress platform in hotel service with the 10+ best WordPress Hotel Themes based on their outstanding features. Before jumping into the main part. Make sure you already have known about Building a website with WordPress and How to build a Hotel site. You will be walked-through our carefully hand-picked collection of WordPress themes which perfectly fit for a WordPress based hotel website. Adomus is another important hotel WordPress theme created by HotelWP. It is the best choice for hotels, campsites and vacation rentals (B&B, aparthotel, holiday home…) and includes their own robust booking system HBook, one of the best selling booking system for WordPress. If you wish to have a site up and running without having to be a WordPress expert, this is your best bet. Adomus is very intuitive, user-friendly and they intentionally offer a limited number of options and features, well selected for the hotel industry needs. Less is sometimes a whole lot more! The theme offers multiple homepage layouts, simple drag-and-drop page builder with a choice of sections (welcome word, accommodation list, posts from the blog, testimonials, video, gallery, call to action…), multilingual translation ready theme (compatible with WPML and Polylang), one click demo data importer for a quick start, live customizer and has a fully responsive design. The booking engine itself, HBook plugin which is bundled for free, is incredibly powerful to match many different pricing and booking rules. Yet, it is very intuitive and well coded which means that the set up is easy even for more complex pricing structure. Discount and coupons features are included. PayPal and Stripe payment gateways are integrated. They have add-ons for other payment gateways: RedSys (for Spanish customers), Eurobank (for greek customers) are already available. Soon should be available MercadoPago, PayU, CCAvenue, Mollie,… Offline payment (bank transfer, on arrival) and use of the plugin as a booking request system is possible too. HBook offers iCal synchronization which means that availability is automatically updated both ways with other booking platforms where you might advertise your property (AirBnB, booking.com, TripAdvisor, VRBO, HomeAway,…). Perfect to avoid double bookings, always show up-to-date availability and have a place where all reservations are centralized for a better management. Customer support is available in English, Spanish and French. Anchor is an accommodation oriented WP hotel theme. The special thing of Anchor is the online reservation system is managed by a separately flexible & translatable easy reservation plugin. This is a convenience of Anchor WordPress hotel theme because from here the reservation can be quickly received, managed & processed. Hotel Master is WordPress theme for hostel, hotel, a resort with the best room booking system which allows visitors to browse room availability easily. In the middle of the booking process, they also can change options or re-select the room smoothly with ajax feature without page refreshing. The COUPON post type helps create a coupon code for customers, set the coupon code, coupon amount, coupon expiration date, discount type as a percentage or specific credit amount. In addition to that, page creation is a powerful option of Hotel Master WordPress reservation theme where homepage, slider, sidebar, blog, portfolio, room… are created as separated pages. There are 3 kinds of the slider: Master Slider, Flex/Nivo Slider, Post Slider in which Master Slider is the most advanced responsive HTML5 WordPress slider plugin to manage slider’s elements easily using its drag & drop ability and you can also use its timeline ability to control transition period. With the WooCommerce supported, Hotel Master can be a hotel booking WordPress theme or a normal theme without any problem, the stylesheet is prepared to suit the theme for WooCommerce as well. Starhotel is a responsive WordPress Hotel Template based on Bootstrap which is the most popular HTML, CSS, and JS framework for developing responsive, mobile first projects on the web and helping front-end web development faster and easier. With Responsive, Retina Ready, Cross-Device/Browser Compatible functions, Starhotel is surely optimized to have a perfect performance on all devices (iPhone, iPad, Android, laptop…) and all popular browsers. The most extraordinary feature of this nice WordPress Hotel Template is the working reservation form where visitors or potential guests can easily view rooms with detail information and photos or send a booking by filling email address, room type, check-in & check-out date, the number of guests. Besides that rooms also are easily created and edited from the dashboard. There is one thing I should mention is the competitive price of Starhotel WordPress Theme responsive with 48$, in the meanwhile you normally have to pay around 59$ for a similar WordPress Hotel Template. The only missing item of Starhotel theme is video tutorials. I have tried to search it but I could only find an introduction video with simple and poor quality. Hotel Leisure is a perfect choice for any website dedicated to leisure and recreation business, like golf clubs, soccer and tennis center, leisure pools and spas, holiday resorts, hotels and other similar activities. This hotel WP theme integrates Ninja Forms Plugin friendly by creating a nice drag & drop field organization. Especially, Hotel Leisure WordPress Theme comes with valuable well-known plugins such as Visual Composer to bring an easy drag & drop content management; Slider Revolution to bring powerful effects: good display, video embedding, user interaction, responsive, SEO friendly. These 2 plugins are premium ones but are packed in Hotel Leisure Theme WP with no extra cost. Furthermore, admin panel with an easy to use is also a special feature of Hotel Leisure where you can customize any setting with a few clicks and create unique designs to meet any demand. Additionally, Hotel Leisure Theme is designed with large beautiful images, three levels sub-menus depth menus with drag & drop manager, great CSS3 animations, clean and modern typography, unlimited colors which bring this WordPress Hotel Theme a perfect look and attract any visitor from the first sight. Nice Hotel is a WordPress theme designed for hotels, hostels, resorts, spas and any type of service which requires a reservation system. Coming with the booking Wizard, right the front end, your potential guests just need to choose a room type, fill in check-in & check-out date, they will know the availability and price of the room. The room reservation can be done easily by inserting required information and the confirmation will be sent directly to your customers’ email. On the other hand, the accommodation management feature helps you quickly add room’s images, room description & room facility. Interestingly, from here it is also connected to the hotel booking system where you can reserve a relevant room with check-in & check-out date. It is also worth mentioning about other outstanding features of this Hotel WordPress Theme: Blog where you can write any post related to accommodation services or other fields; Testimonials management to select the preferential testimonials and automatically add them to the website homepage; Photo gallery to collect all your photos and put them into a good order for later easy usage; shortcodes to create accordion, toggle & tabs, alerts & messages, buttons, drop caps & lists, Google map, columns, video with very little effort; Typography; Left sidebar with search function, reservation system, categories, tags… Beside that Events Management allows adding all your latest events to your website using the built-in events manager. 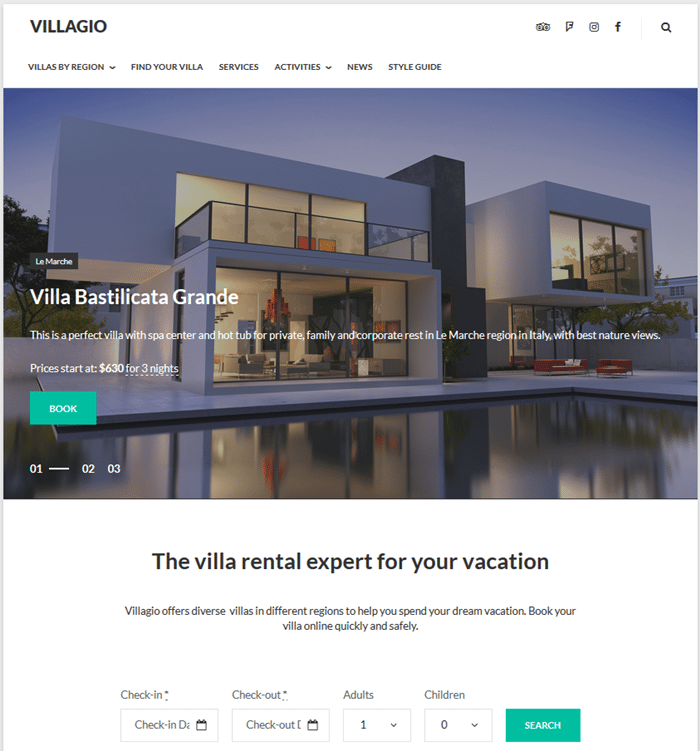 Villagio Property Rental WordPress theme comes with a great responsive design and a full-blown WordPress property reservation system. In terms of functionality and design, the theme is suitable for any type of a hotel establishment – hotels, inns, vacation rentals, hostels and similar (simply replace villas in the demo with your hotel rooms). Villagio delivers a perfect mobile design – just browse it on your cell phone or tablet and you’ll see that it works as flawlessly as on desktops. All modern travelers will be able to preview your accommodations and book any quickly and safely. It also comes with lots of customization options, header slider to present features accommodations (you may replace this widget with any to your liking), grid and full-width layouts, etc. Villagio is powered by a dedicated room booking plugin – MotoPress Hotel booking (included for free), which powers the accommodations listing and the booking system on the site. It allows you to add unlimited accommodations, feature them with all details (photos, descriptions, amenities, sleeping arrangements, bed types, capacity, view, etc. ), add seasonal pricing and rates to all rooms, use discount coupons, enable online payments (PayPal, 2Checkout, Stripe, Braintree, Beanstream/Bambora) or payments after arrival, confirm bookings manually or upon payment, etc. The booking system also allows synchronizing your direct hotel bookings with those that come from OTAs like Airbnb (via iCalendar format). The booking system is translated into 14 languages and is translation ready. Another theme is put in this collection of best WordPress Hotel Themes – Vierra helps you build beautiful hotel website just in seconds. With no special code required, this WordPress hotel reservation theme is very easy to use even for a beginner. Coming with 6 different room layouts, you will have a variant selection to display rooms. The powerful admin panel is an attractive feature of Vierra theme because you can customize your site with some simple clicks. More than that, custom colors and 500+ Google Fonts, beautiful gallery with video supported can help you build an amazing hotel website. Being released on ThemeForest from 2014, until now Vierra is reaching 1200 sales and is a trending search in the biggest theme market for the best hotel WordPress themes. Luxury is a WP hotel theme with fast & easy room booking system which allow you to check the availability of rooms. In the middle of the booking process, you can edit or remove your selection with its awesome ajax features. Integrated with advanced payment methods such as PayPal, Authorize.net, Skrill, Bank transfer, your guests can easily make the payment when processing room reservation. This WordPress hotel reservation theme allows you to create unlimited things such as unlimited hotels/ branches, unlimited room types with facilities, unlimited special offer by date range, unlimited seasonal price…. Paradise Cove also should be put into your consideration when you choose a good WordPress hotel theme because of its features. The powerful booking system helps you receive reservation requests directly from your WordPress admin. Later on, if it is necessary, you can communicate with your customers. Besides that, the contact form brings you an excellent tool to create an unlimited flexible contact form. The easy to use weather widget is also included in this hotel WordPress theme which shows the local climate conditions of the destination. A professional WordPress theme for the resort, hotel, motel, hostel with online booking reservation form. 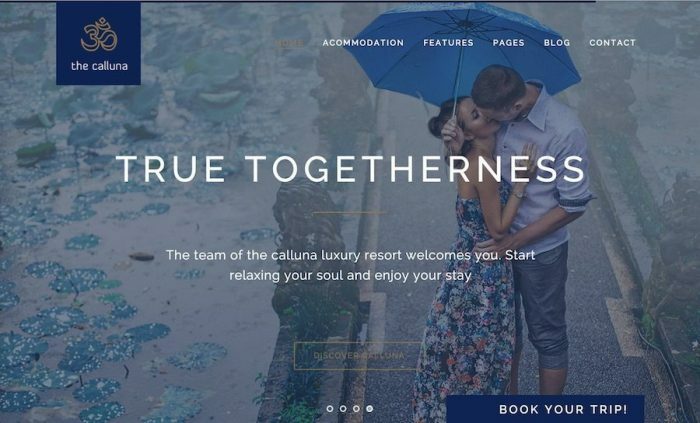 Hotel Calluna allows you to add rooms, events & offers easily to your hotel WordPress site with custom post types. This hotel theme is quite flexible, provides fully abilities to edit colors, menu, page design or typography. You will be able to create a unique hotel website on your own without coding knowledge. 4 preset styles from Soho accommodation theme with a booking system will turn your WordPress blog into a nice looking Hotel website with full functionalities to offer online room booking. Your clients can check available rooms, pay over Paypal payment method easily. In case you want to make some events for your hotel/service apartments, a events management is ready to use, you don’t have to do any dirty tasks to get it done. 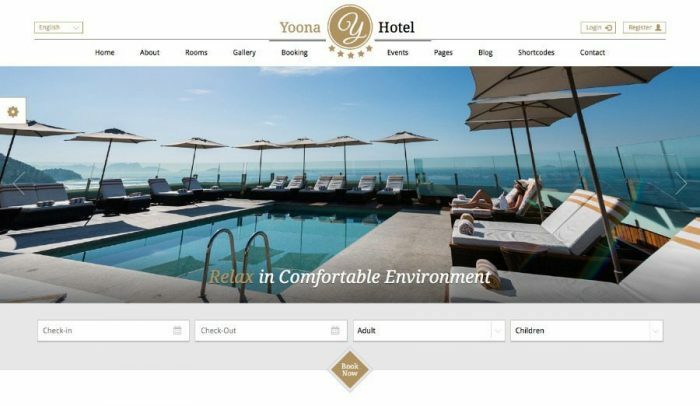 One of the best accommodation theme for WordPress, Yoona is a fully customizable theme for resorts or hotels. This hotel theme provides up to 6 color presets for you to choose. An ajax booking system called “Ravis Booking” allows users to check & booking for available rooms from your hotel/hostel/resort. Designed with the flat design in mind, it also supports some parallax sections to make your hotel website looks fancy. By using Yoona, you will have a comprehensive hotel/resort website within hours with booking, pricing tables, events, blog and more. A lovely solution to make a hotel booking website for your hotel. Luxen comes up with 2 homepages. If you want boxed version or wide version, this hotel booking website serves you well no matter what. This mobile-friendly resort theme has some variations for the blog, category archives layout with nice & comfortable animations. Luxen will probably a good choice for the hotel website. First mentioned Hotel WordPress Theme in the list is Sailing which has just been created for a little while. This hotel theme comes with an excellent online reservation system managed by TP Hotel Booking Plugin for WordPress. From here, you can easily create rooms, coupons, room types, room capacity and control bookings, customers, and payment. Over than that, going to the report part, you can view charts on booking price and room availability by inserting date then clicking and dragging in the plot area to room in the chart. This plugin allows you to export reports in .csv files if necessary. Sailing hotel WordPress theme supports Slider Revolution, SiteOrigin page builder, WooCommerce, Contact Form 7, Live preview customizer, translation ready…to turn your hotel website into a powerful one. Looking into the demo, I am so surprised to see such an attractive WordPress theme with unique design, amazing parallax, unlimited color & skins. All of these is integrated into 6 homepages: 2 homes wide, 2 homes boxed, 1 home background video and 1 home support RTL. If the above features cannot beat you, let see the customer support service of this theme vendor. The documentation of Sailing theme is also available for you to access anytime. Read it to understand better! 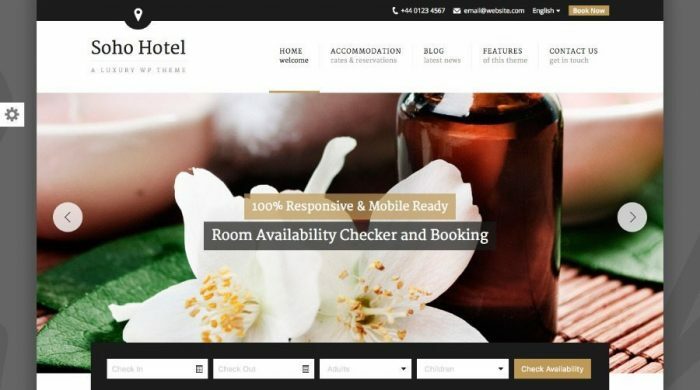 The Place is still put in the collection of best WordPress Hotel Themes 2015 although it was built since 2012 and continues to be used until now because of its brilliant features. Coming with a simple and efficient booking hotel system, the availability of rooms can be easily displayed and the reservations are well controlled through your website. In case your website does not require a booking system, you are able to deactivate this function by one click from theme options panel. With the support of Contact form 7 plugin, you can receive requests through reservation form directly in your inbox. This email notification can be used on top of the booking system or without the booking system. I have just listed the best WordPress Hotel Themes from which you can consider to choose one if you are planning to run the hospitality service. All of them have powerful online hotel booking system which is easy to process and control and outstanding features. My collection here is not a fixed list, it will continue being updated when other high-quality WordPress Hotel Themes are released or I received your recommendation if you find any good WordPress Theme for your Hotel. Freely leave your thought below! Awesome Collection! Take a look at Restinn– A Booking One Page Theme For Resort Hotel.